Home > Eye Treatments > What Are Intravitreal Implants? Intravitreal implants sound like an unusual form of plastic surgery but they are nothing to do with cosmetic treatments. The vitreous is the gel-filled cavity in the centre of the eyeball and intravitreal is a term used to describe putting something into the vitreous. An implant into the centre of the eyeball is a new and innovative way of introducing drugs to help treat various types of eye disease. Several diseases affect the back of the eye and damage the retina, causing either a loss of vision or serious visual impairment. One of the most common is diabetic retinopathy – the damage to the retina that results from chronic diabetes. Another is retinal vein occlusion, in which one of the main veins from the back of the eye becomes blocked, causing bleeding, retinal detachment and swelling. 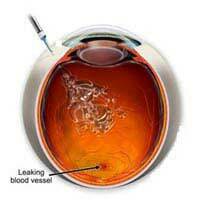 Age-related macular degeneration and eye infections can also damage the delicate structures of the retina. Although these eye diseases are all different, with different causes and courses, they do have some basic pathological processes in common. All of them result in inflammation in the retina, as the body sends extra fluid, cells and growth factors to try to help the eye to heal. Unfortunately, because the eye is in a fairly enclosed space inside the orbit of the skull, inflammation itself can be very damaging. Treating eye diseases is quite difficult, because the drugs that are needed to reduce inflammation cause quite a range of side effects when they are just injected – and only a small amount reaches the eye where it is really needed. In the last few years, research has been investigating the value of treatments such as steroids when they are actually injected directly into the eye. Some drugs that decrease the growth of new blood vessels, and that damp down the inflammation response have been trialled in patients with different eye diseases and have been shown to have a positive effect. Having the treatment is a fairly quick procedure and doesn’t require an overnight stay in hospital but it has to be done under very clean and sterile conditions and by a doctor who is experienced in doing this type of injection. Common side effects include an increase in the pressure in the eye ball, which can lead to more problems, and infection. Puncturing the eyeball provides an entry point for bacteria and if this happens, the inside of the eyeball can become extremely heavily infected, causing a condition known as uveitis. The side effects and problems that arise after an intravitreal injection are more likely if several injections are required. For a condition such as age-related macular degeneration, the inflammation needs to be treated over a period of months, if not years, to prevent loss of sight. As the steroids and other drugs injected into the vitreous are broken down in the body, the injections need to be repeated at least once every month for the treatment effect to be sustained. Having regular, monthly injections for several months may be required, but the problems it causes may be so severe that the treatment has to stop. No treatment has yet been formally licensed but researchers in different parts of the world are trying to produce an implant that can be placed into the vitreous that releases its drug gradually over a period of months. The insertion procedure is no more risky than an injection, and because it doesn’t have to be repeated as often, if could be more effective and safer. The first intravitreal implants could become available as early as 2011, although many more trials in different eye diseases need to be concluded before they become a widespread treatment. In the next 5 years, though, this type of long-acting treatment could really help slow down the progress of some of the worst eye diseases experienced by people in the UK.